Upon interaction with B7 homolog 1, programmed death-1 (PD-1) transmits a critical coinhibitory signal to T cells to negatively regulate immune responses. By extensively searching the genomic database with the IgV region of PD-1, we identified a homolog and named it PD-1 homolog (PD-1H). PD-1H is broadly expressed on the cell surface of hematopoietic cells and could be further upregulated on CD4+ and CD8+ T cells following activation. 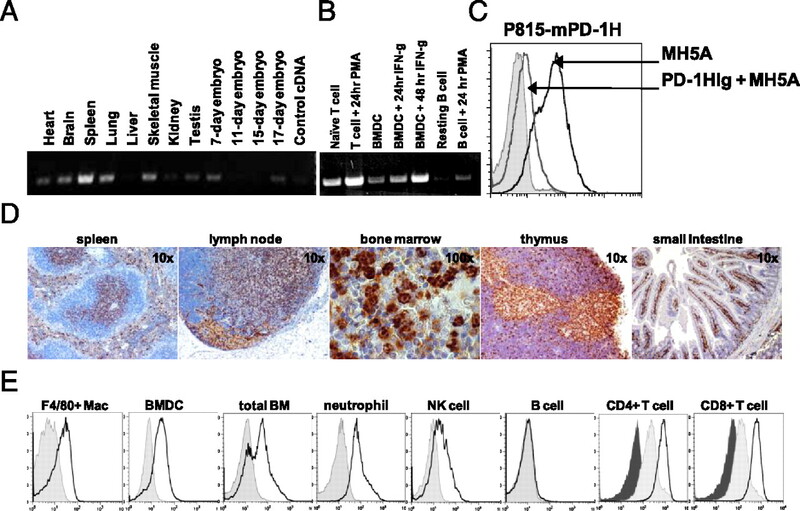 We have generated an mAb against PD-1H, which strikingly prevents acute graft-versus-host disease in semi- and fully allogeneic murine models, leading to full chimerism following treatment. Graft-versus-host disease remains a primary hindrance to successful allogeneic hematopoietic cell transplantation therapy for the treatment of hematologic malignancy. Therefore, manipulation of PD-1H function may provide a new modality for controlling T cell responses to allogeneic tissues in transplant medicine. The CD28 family of cell-surface signaling molecules is pivotal in directing the growth, differentiation, and survival of T cells (1, 2). The CD28 family is composed of costimulatory and coinhibitory molecules. CD28 costimulates T cells when ligated to B7-1 (CD80) or B7-2 (CD86), whereas CTLA-4 (CD152) coinhibits T cells when bound to the same ligands (3, 4). ICOS (CD278) also costimulates T cells when bound to B7-H2 (ICOS-L, CD275) (5). Programmed death-1 (PD-1; CD279) inhibits T cells responses when bound to B7 homolog 1 (B7-H1; CD274) or B7-DC (CD273), whereas B and T lymphocyte attenuator (BTLA; CD272) expressed on T cells attenuates T cell responses when interacting with herpesvirus entry mediator (CD270) on APCs (6, 7). Interestingly, PD-1 and BTLA have also been shown to function as ligands to signal through B7-H1 and herpesvirus entry mediator, respectively (8, 9). Cosignaling molecules have been essential to understanding T cell function and immune regulation in homeostasis and disease, including their role in peripheral T cell tolerance to alloantigens and induction of graft-versus-host disease (GVHD) (10–12). In this study, PD-1 homolog (PD-1H), a novel T cell cosignaling molecule, was found to be critical for modulation of allogeneic responses in acute GVHD (aGVHD). PD-1H mAb therapy potently prevents the induction of GVHD in semi- and fully allogeneic models of disease. Furthermore, a single dose of PD-1H mAb is capable of fully preventing GVHD and results in survival of ∼100% of mice long-term. As allogeneic hematopoietic cell transplantation remains the most effective treatment for the eradication of hematologic malignancies, despite the dangerous graft-versus-host effects, we suggest PD-1H as a useful therapy for modulating allogeneic responses to recipient tissues in transplantation settings. Six- to 8-wk-old mice were purchased from the National Cancer Institute (Frederick, MD). Mice were housed in specific pathogen-free facilities and treated in accordance with Institutional Animal Care and Use Committee standards at Johns Hopkins (Baltimore, MD) and Yale Universities (New Haven, CT). Full-length mouse PD-1H cDNA for cloning into pcDNA3.1 vector (Invitrogen, Carlsbad, CA) was generated by PCR from total splenocyte cDNA. The mouse (m)PD-1H extracellular domain was fused in-frame to the CH2-CH3 portion of mIgG2a as previously described (13). mPD-1HIg plasmid was stably transfected into Chinese hamster ovary cells, and expression was confirmed by ELISA. PD-1HIg fusion protein was produced and purified as previously described (13). mAbs were generated against mPD-1H by immunization of Armenian hamsters with mPD-1HIg, fused to sp2/0 myeloma cells (American Type Culture Collection, Manassas, VA), and produced as previously described (14). Abs against CD4, CD8, Gr-1, CD11b, CD11c, F4/80, DX5, CD19, H-2Kd, H-2Kb, I-A/E, anti-hamster Ig (hamIg)-biotin, and streptavidin-allophycocyanin were purchased from eBioscience (San Diego, CA). MH5A was biotin-labeled using a PEO4 biotin-labeling kit from Pierce (Rockford, IL). P815 mastocytoma cell line was purchased from American Type Culture Collection and stably transfected with full-length mPD-1H with Fugene (Roche, Mannheim, Germany) according to protocol. A mouse multiple-tissue cDNA panel (Mouse MTC Panel I) was purchased from Clontech (Palo Alto, CA). For cell-specific mRNA expression analysis, cells were enriched by MACS beads (Miltenyi Biotec, Auburn, CA), and cDNA was prepared using a SMART PCR cDNA synthesis kit (Clontech). Tissues from wild-type C57BL/6 mice 6 wk of age were harvested, placed in formalin fixative, and paraffin embedded. Tissues were deparaffinized and rehydrated prior to Ag retrieval in citrate buffer. Tissues were stained with 5 μg/ml biotin-labeled MH5A or biotin-labeled hamIg anti-trinitrophenyl control mAb (eBioscience), followed by incubation with amplification system k1500 (DakoCytomation, Glostrup, Denmark). HRP staining was visualized with 3-3′ diaminobenzidine (Sigma-Aldrich), and slides were counterstained, cleared, and mounted. In aGVHD models, mice were irradiated using a Gammacell 40 irradiator (Cesium source, 0.50 cGy/min dose rate; Atomic Energy of Canada) 12 h before adoptive transfer. In the semiallogeneic lethal model (12 Gy), C57BL/6 bone marrow (BM) was isolated from femurs and tibias by flushing bones with RPMI 1640 supplemented with 10% Fetalclone III (Hyclone/Thermo Scientifc) and penicillin-streptomycin (Roche) and disaggregated through a 100-μm mesh screen (BD Biosciences) with a rubber syringe plunger. RBCs were lysed in ACK buffer, and T cells were depleted with CD90.2 (thy1.2) MACS beads according to protocol (Miltenyi Biotec). T cells were isolated from total lymph node (LN) cells and enriched using pan T cell MACS negative selection beads according to protocol (Miltenyi Biotec). BM plus T cells were adoptively transferred to B6D2/F1 mice by tail vein injection with 200 μg MH5A or hamIg. In the fully allogeneic lethal model (9 Gy), BALB/c BM was isolated as above, whereas total LN cells were transferred without selection. Each experiment was performed at least three times with five mice per group. Sequence analysis was performed using MacVector (MacVector, Cary, NC). Flow cytometry analysis was performed using FlowJo analysis software (Tree Star, Ashland, OR). PD-1H was initially identified by searching National Center for Biotechnology Information databases for molecules with IgV region similarity to known cosignaling molecules. PD-1H (accession number: NM_028732; http://www.ncbi.nlm.nih.gov; Mouse Genome Informatics symbol: 4632428N05Rik) is a 309-aa (311 aa in human) type I transmembrane protein composed of seven exons (Fig. 1A). The location of this open reading frame is on the forward strand of murine chromosome 10 (location 10qB4) and the reverse strand of human chromosome 10 (location q22.1). This putative protein has 85.6% similarity between mouse and human and contains an N-terminal signal peptide, single IgV domain, transmembrane region, and cytoplasmic tail (Fig. 1B). Genomic organization, sequence, and alignment of PD-1H. A, mPD-1H is composed of seven exons: 5′ untranslated region and signal peptide are located in exons 1 and 2; extracelluar domain is located in exons 2, 3, and 4; transmembrane domain is in exon 4; intracellular domain is in exons 4, 5, 6, and 7; and 3′ untranslated region is located in exon 7. B, The mouse (top) and human (bottom) full-length PD-1H sequences have 85.6% similarity (shaded). All seven cysteines are conserved between species (yellow). Mouse and human have three conserved N-linked glycosylation sites. mPD-1H has four N-linked myristoylation sites (blue letters), whereas human PD-1H has only three. The mouse intracellular region has three tyrosine residues (blue), whereas the third tyrosine residue in the human protein is mutated to a histidine (red). Mouse and human proteins have two potential conserved protein kinase C docking sites (red letters). Additionally, mouse and human PD-1H proteins have 15 conserved proline residues (green). C, Phylogenetic analysis of full-length mPD-1H with CD28 family members using a Gonnet similarity matrix and neighbor joining method. D, Matrix of mPD-1H IgV domain identity (white) and identity and similarity (shaded) with members of the CD28 family IgV and IgC domains. E, Alignment of mPD-1H IgV domain with CD28 family member IgV and IgC domains. Similar and identical residues are shaded gray. 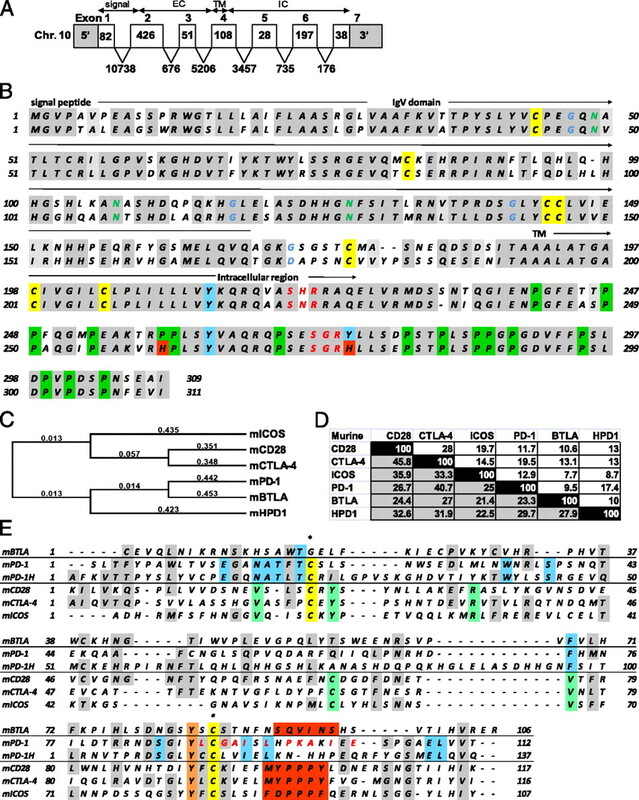 Conserved cysteines required for IgV β sheet linkage are in yellow (note BTLA has an IgC domain), and conserved tyrosine residues are shaded in orange. Residues that align only for CD28, CTLA-4, and ICOS are in green, whereas residues that align for PD-1H and PD-1 are in blue. Ligand-binding sites for BTLA, CD28, CTLA-4, and ICOS are indicated in red blocks, whereas the PD-1 ligand-binding site is in red letters. The single IgV domain of PD-1H had sequence similarity with both CD28 and B7 family molecules. However, although the PD-1H IgV domain had similarity with the B7-H1 IgV domain (data not shown), full-length PD-1H resembled CD28 family molecules by phylogenetic analysis and appeared related to PD-1 (Fig. 1C). Phylogenetic analysis of mouse and human full-length proteins using the neighbor joining method suggests PD-1H is a distant relative to other CD28 family members, as are PD-1 and BTLA. Alignment of the PD-1H IgV region with CD28 members shows highest identity with PD-1 while having the highest similarity with CD28 (Fig. 1D, 1E). Interestingly, PD-1H and PD-1 share several residues in the IgV domain that are unique only to these two molecules, whereas PD-1H contains a 12-residue segment that does not align with any CD28 family molecules and appears unique in the mammalian proteome, indicating this moiety may confer unique function to PD-1H (Fig. 1E). The cytoplasmic tail of PD-1H is highly conserved in mice and humans, but unlike PD-1, PD-1H does not contain an ITIM or immunoreceptor tyrosine-based switch motif. However, the intracellular tail contains two potential protein kinase C binding sites at aa positions 220 and 272, as well as proline residues that could potentially function as docking sites (Fig. 1C). Therefore, PD-1H may potentially function as both a receptor and a ligand. Reminiscent of PD-1, PD-1H mRNA and protein were found to be broadly expressed (Fig. 2A–D). PD-1H mRNA was expressed on most tissues examined including heart, brain, lung, muscle, kidney, testis, and embryo, but was most highly expressed in the spleen (Fig. 2A). Cell-specific mRNA expression showed that PD-1H was expressed in naive and activated T cells, unstimulated and IFN-γ–stimulated BM-derived dendritic cells (BMDCs), as well as in PMA-activated B cells (Fig. 2B). An mAb (clone MH5A) was generated by immunization with PD-1HIg, which specifically stained P815 cells transfected with full-length PD-1H plasmid, but not control plasmid, and binding could be blocked by addition of excess PH-H1Ig (Fig. 2C). MH5A specificity was confirmed by ELISA and immunohistochemistry (IHC) (data not shown). IHC staining with MH5A for PD-1H expression in C57BL/6 spleen showed specific staining for PD-1H in both the T cell zone and marginal zone (Fig. 2D). Similarly, LN T cell zones were positive for PD-1H, as well as endothelial cells of the afferent lymphatic sinus and high endothelial venules. Medullary thymic epithelial cells were highly positive for PD-1H, whereas small clusters of unidentified cells staining with a granular cytoplasmic pattern were positive for PD-1H in both the thymus and BM. In the small intestine, T cells in the lamina propria were positive for PD-1H. PD-1H expression analysis. A, PD-1H mRNA is broadly expressed by multiple tissue blot. B, PD-1H mRNA is expressed in naive and activated T cells, 6-d unstimulated and IFN-γ–stimulated BMDCs, and PMA-activated B cells. C, MH5A mAb binds P815 cells stably transfected with full-length mouse PD-1H, but not control transfected P185 cells (shaded histogram). Binding of MH5A was competitively inhibited by addition of excess soluble PD-1HIg. D, Expression of PD-1H on normal tissues by IHC examination of paraffin-embedded C57BL/6 tissues using biotin-labeled MH5A mAb. Original magnification ×10. E, Flow cytometric analysis of PD-1H surface expression. mF4/80+ peritoneal macrophages, circulating CD11+Gr-1+ neutrophils, and mature 7-d GM-CSF plus IL-4–cultured BMDCs are positive for PD-1H, as are a large percentage of total BM cells. NK cells express low levels of PD-1H, whereas B cells are negative for PD-1H protein expression. Isotype control staining is shaded. Naive CD4+ and CD8+ T cells constitutively express PD-1H (light gray shaded), which could be further upregulated within 2 h when stimulated with PMA plus ionomycin (open histogram). Isotype control for T cell staining shaded in dark gray. Flow cytometric analysis confirmed expression of PD-1H on F4/80+ peritoneal macrophages, mature BMDCs, total BM, CD11b+Gr-1+ neutrophils, and CD4+ and CD8+ T cells (Fig. 2E). NK cells expressed low levels of PD-1H, whereas B cells were negative. Expression of PD-1H on T cells was most potently upregulated by PMA plus ionomycin (Fig. 2D), whereas anti-CD3 alone, anti-CD3 plus anti-CD28, and Con A were also capable of PD-1H induction (data not shown). These data support a broad expression pattern of PD-1H, which is more comparable to BTLA, ICOS ligand, B7-H1, and B7-H4, as opposed to the more restricted expression pattern of CD28, CTLA-4, and ICOS (15). We employed two models of aGVHD to explore the function of PD-1H in immune modulation in vivo. In the first model, semiallogeneic (partially MHC-mismatched) C57BL/6 (B6, H-2b) naive donor T cells and T cell-depleted BM were adoptively transferred to lethally irradiated C57BL/6 × DBA/2 F1 hybrid mice (BDF1, H-2bxd) (Fig. 3A). The second aGVHD model examined was a fully allogeneic (completely MHC-mismatched) model in which BALB/c (BALB, H-2d) total LN and BM cells were adoptively transferred to lethally irradiated B6 mice (H-2b) (Fig. 3B). Astonishingly, in both models, a single 200-μg dose of MH5A prevented aGVHD and resulted in nearly complete chimerism by day 30, as indicated by flow cytometry for circulating donor CD11b+Gr1+ neutrophils and donor CD4+ and CD8+ T cells (Fig. 3, insets). Analysis of donor T cells in an aGVHD model after transfer of B6 LN cells to BDF1 mice by flow cytometry showed a profound reduction in accumulation and expansion of both CD8+ and CD4+ T cells in spleens and livers with MH5A treatment (Supplemental Fig. 1A). Additionally, MH5A treatment greatly reduced numbers of infiltrating T cells in all aGVHD target tissues examined, including spleen, liver, small intestine, lung, and kidney by IHC analysis (Supplemental Fig. 1B). Moreover, visual observation confirmed MH5A-treated mice retained healthy coat sheen and increased mobility, activity, and appetite compared with hamIg-treated controls. Finally, MH5A-treated mice in both models of aGVHD were capable of living up to 18 mo, with no indication of GVHD or other illnesses such as cancer or infection, thus suggesting a fully reconstituted, normal functioning immune system with tolerance to allogeneic Ags. Anti–PD-1H treatment robustly inhibits aGVHD. A, Lethally irradiated BDF1 mice received 5 × 106 T cell-depleted BM plus 3 × 106 pan T cells and 200 μg hamIg (open triangles) or MH5A (closed squares) on day 0. Inset, Analysis of chimerism at 30 d by FACS analysis of circulating donor (H-2d–negative) neutrophils (light gray bar), CD4+ T cells (dark gray bar), and CD8+ T cells (black bar). B, Lethally irradiated B6 mice received 5 × 106 BM plus 1 × 107 total LN cells and 200 μg hamIg (open triangles) or MH5A (closed squares) on day 0. Inset, Analysis of chimerism at 30 d for circulating donor (H-2d–positive) neutrophils (light gray bar), CD4+ T cells (dark gray bar), and CD8+ T cells (black bar). Our findings are unexpected because few mAbs targeting a single cosignaling molecule are capable of such potent prevention of aGVHD (1). Existing allogeneic transplant therapies typically employ broad pharmacologic immunosuppression or cellular depletion, resulting in immunodeficiency and leading to recurrence of malignancy and infections (16). Therefore, new therapeutic modalities must be developed to specifically inhibit destruction of normal recipient tissues while maintaining overall immune function. During the process of publication, we noticed a recent article by Wang et al. (17) also describes PD-1H as an immune suppressive molecule. Nevertheless, we show for the first time, to our knowledge, that Ab to PD-1H is capable of robustly modulating allogeneic T cell responses accompanied with inhibition of T cell accumulation and expansion in GVHD target organs. Precise mechanisms of PD-1H in the modulation of T cell response, however, remain to be elucidated. Our preliminary studies using in vitro costimulation assays (with anti-CD3 as a mimic TCR signal) and allogeneic MLR using coated or soluble MH5A did not show significant effects on T cell proliferation (Supplemental Fig. 2A, 2B), suggesting that MH5A may not directly inhibit T cell function, but that MH5A may have a possible role in non-T cell function in vivo. Administration of PD-1HIg recombinant fusion protein could also prevent aGVHD, a result similar to the treatment by MH5A (data not shown). This finding implicates a possible antagonistic effect of MH5A in vivo. These findings suggest that PD-1H plays a significant role in immune function and as a result need to be examined in detail for mechanisms of action. This work was partially supported by Grants CA97085 and CA85721 from the National Institutes of Health. The PD-1H sequence presented in this article has been submitted to the National Center for Biotechnology Information ( http://www.ncbi.nlm.nih.gov) under accession number NM_028732.
. 2004. T lymphocyte co-signaling pathways of the B7-CD28 family. Cell. Mol. Immunol. 1: 37–42.
. 2005. The B7 family revisited. Annu. Rev. Immunol. 23: 515–548.
. 1990. T-cell antigen CD28 mediates adhesion with B cells by interacting with activation antigen B7/BB-1. Proc. Natl. Acad. Sci. USA 87: 5031–5035.
. 1991. CTLA-4 is a second receptor for the B cell activation antigen B7. J. Exp. Med. 174: 561–569.
. 2000. Costimulation of T cells by B7-H2, a B7-like molecule that binds ICOS. Blood 96: 2808–2813.
. 2006. Contribution of the PD-1 ligands/PD-1 signaling pathway to dendritic cell-mediated CD4+ T cell activation. Eur. J. Immunol. 36: 2472–2482. 2010. Mechanisms maintaining peripheral tolerance. Nat. Immunol. 11: 21–27.
. 2000. T-cell co-signalling molecules in graft-versus-host disease. Ann. Hematol. 79: 283–290.
. 2009. Acute graft-versus-host disease: from the bench to the bedside. Blood 114: 4327–4336.
. 2002. Inducible costimulator costimulates cytotoxic activity and IFN-gamma production in activated murine NK cells. J. Immunol. 169: 3676–3685.
. 2009. Acute graft-versus-host disease: new treatment strategies. Curr. Opin. Hematol. 16: 427–436.
. 2009. Emerging drugs for acute graft-versus-host disease. Expert Opin. Emerg. Drugs 14: 219–232.
. 2011. VISTA, a novel mouse Ig superfamily ligand that negatively regulates T cell responses. J. Exp. Med. 208: 577–592.